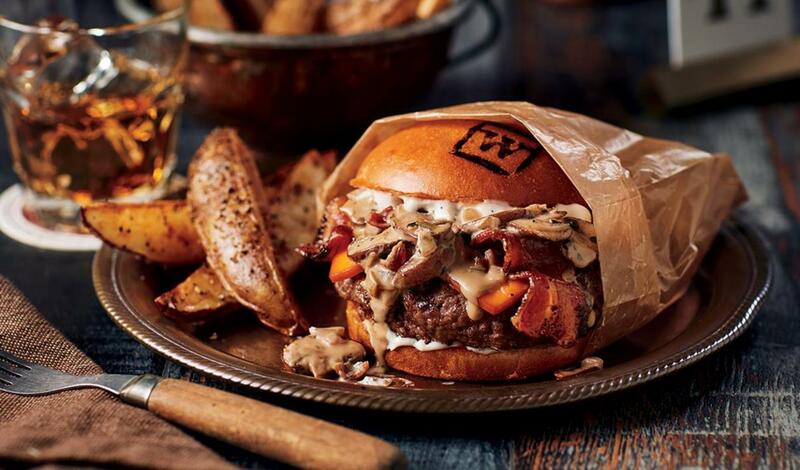 An all-beef patty topped with smoked cheddar cheese, crispy bacon slices, creamy mushroom sauce and bourbon mayo. Reduce bourbon by half. Combine ingredients and whisk to incorporate. Reserve refrigerated. Cook the bacon until crisp and remove from pan, drain, and roughly chop. Sauté onions and mushrooms in the remaining bacon fat until slightly softened. Add garlic and deglaze with bourbon. Add cream and rosemary and simmer until reduced and slightly thickened, about 5 minutes. Return bacon pieces to the sauce and season to taste with salt and pepper. Hold hot for service. To assemble one burger, spread 1 T. Bourbon Mayo on each side of the bun. Season the burger patty and cook. Top with smoked cheddar cheese, bacon, and Mushroom and Bourbon Sauce.